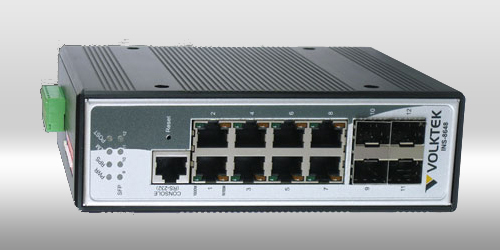 Volktek’s INS-8648 Managed Industrial switch is equipped with 8 port 10/100/1000Base-T and 4 Gigabit SFP slots. Engineered with hardened components and enclosed in a rugged case, the switch can operate in temperatures from 0°C to 70°C (wide temperatures from -40°C to 70°C for INS-8648W) and also has an excellent tolerance capability to high vibration and shock. As an Industrial switch, the INS-8648 suits your heavy industrial environments and yet contains all the standard features of other switches.